Exploring the garden through the five senses. Teaching the students how to document their experience in the garden through text and visuals. Understanding the space of the garden through imagination and meditation. We utilized a number of techniques from the Bihar School that creatively introduced students to the focusing and calming effects of breathing, movement and visualization. Finding characters in the garden and constructing their narratives through the narrative arch of exposition - growing tension - climax - declining tension - resolution. The curriculum is based on the 4 C’s – creativity, collaboration, communication and critical thinking. Split into three phases – discovery, skill development and production – the program aimed at strengthening the participants’ sense of curiosity, expanding their knowledge, and developing their creative and collaborative abilities. At The Spring Sessions (an independent art education initiative) in Amman, Jordan (June 2014) I taught a workshop on narrative, research and performance. Using the life and work of the poet 'Arar, participants and I collectively wrote and directed a performance that was presented to the public at the historic King Ghazi hotel on June 27 2014 (where the oft-exiled poet was though to have stayed in the early 20th century). Through the use of poetry and a dialogue between 'Arar and his biographer, we recreated the poet's tumultuous relationship to his identity, the women in his life and the bottle. An 8-week workshop for looking at how our personal voices as writers develop in response to our environments. We focus on writing and reading fiction, studying voice, style, character, setting, dialogue, and plot. We will write both independently and as a group, taking inspiration from a variety of authors and meeting with guest speakers to discuss publishing our work. The main question we will concern ourselves with is: How can I create a fictional world that is both authentic and engaging? 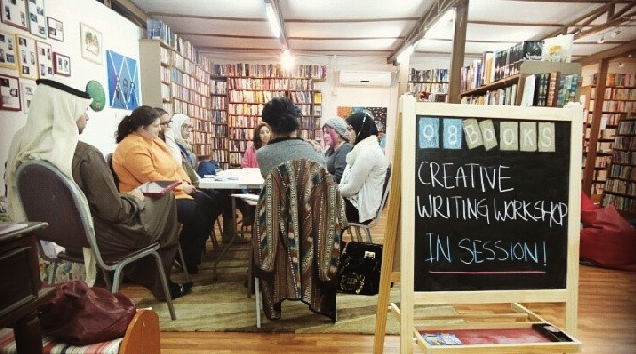 In Fall 2014 I guided a group of ~8 AUK students through a series of writing exercises and reading discussions to help each of them gain confidence in their personal writing voice.The workshop was designed to stimulate new content and ideas for the Fikir student journal. Authors we read include: Susan Abulhawa, Ernest Hemingway, James Baldwin, Joan Didion, Lydia Davis, Simon Rich and Sophia Al Maria. I created a series of fast-paced writing exercises that would lead to the uncovering of some of the contradictions embedded in the participants' daily lives and Kuwaiti society. As part of the Creative Minds for Social Good workshop's aim to create engaging social video campaigns, I presented 5 Approaches for Social Video Campaigns for conceiving interesting premises (email me for more examples). I worked closely with the group tackling gender-based violence, mentoring them through their successful grant application process. Offered in 2015 and 2017, this course helped inspire participants to write social media captions that were creative, strategic, and engaging. Made up of mini-presentations and collaborative exercises, this course was highly participatory and dynamic. Read more here. tarot in the healing of the psyche. This two-part workshop was conducted in both June 2017 and July 2018, covering tarot history, minor and major arcana, and different card spreads. Participants gave each other readings and delved deep into tarot archetypes and symbols.